It’s time for a new vehicle and you’ve been carefully considering your options. You want something that is more spacious than a sedan, powerful enough to take you wherever you want to go, but sleek, stylish, and guaranteed to turn heads. You want form and function–you want the Nissan Murano. It’s perfect for city commuting and longer road trips–keeping you comfortable and entertained no matter how long your drive is. With a Nissan Murano you’ll be looking for any excuse to get behind the wheel and take it for a spin. 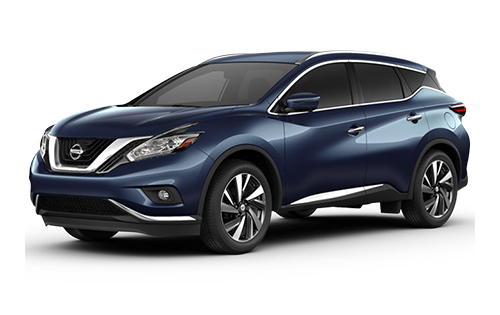 If you’re looking for a Nissan Murano near Calgary, come to Cochrane Nissan–the newest Nissan dealership in the area. You’re sure to find exactly what you’re looking for at Cochrane Nissan and if it’s not quite perfect, make it so with our customization boards and tablets to create the vehicle of your dreams. Let us assist you in finding or creating the Nissan Murano of your dreams. You’ll love our state-of-the-art dealership and friendly sales team members–in fact, you’ll find our commitment to you and your automotive needs in every department! At Cochrane Nissan, we are proud to offer you service so great you’ll tell your friends. What are you waiting for? When you’re ready to get behind the wheel of your new Nissan Murano, visit us at 7 River Heights Dr in Cochrane, AB, or give us a call at 403-851-8585. With our 4-acre lot, you’ll always have plenty of Nissan Murano options! Get service for your Nissan Murano on your schedule with our Nissan dealership’s Quick Service bays. Turn heads wherever you go and stand out from the crowd with the Nissan Murano. Inspired by the future of aerospace, the body is aerodynamic and striking. The available Power Panoramic Moonroof provides an open, natural atmosphere for everyone in the vehicle to enjoy. Signature LED and daytime running lights provide both style and added visibility while driving in dark or low light conditions. Inside, experience a more intuitive and simpler control panel, ambient lighting, and the perfect temperature every time thanks to Intelligent Climate Control. Want the latest in technology? The Nissan Murano offers convenient and advanced features like the Advanced Drive-Assist Display to provide you with the information you need like turn-by-turn directions, caller ID, or safety features right before your eyes to help keep your focus on the road. Your passengers can access music, apps, and more on the 8-inch colour touch-screen thanks to NissanConnect that works with your smartphone to give you hands-free access to the things that are important to you. Press the available Siri Eyes Free button on your steering wheel to use Google for directions, send an email, or add an event to your calendar.